I was reading this morning from Philo’s De Vita Mosis. Becoming well acquainted with Philo is a necessary part of my attempt at a research program (which matters little for the present post). Philo, by the way, was a contemporary of Jesus and the writers of the New Testament. He represents some rather fascinating thought existent in first-century Judaism. His thought’s on the plagues is equally interesting. The Lord did not treat the Egyptians as they deserved. The Lord did not treat the Israelite’s as they deserved. He does not treat us as we deserve. Why? Because the Lord is compassionate, slow to anger and abounding in love. How are we, his children, treated? As sons and daughters of the King (Rom. 8). Why? Because Jesus Christ took our place (2 Cor. 5) and was treated as we deserve (Rom. 5; 8). Praise God! One final thought. The grace and mercy of God towards sinners will not always remain. 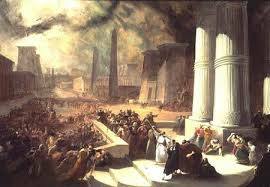 2 Peter 3 details very clearly how the Lord will return and hand out final judgment. Remember, there is “now no condemnation for those who are in Christ Jesus” (Rom. 8:1, emphasis mine). The inverse is also true. There is therefore now condemnation for those who are not in Christ Jesus” (see John 3:18). This is why the Scriptures say, “Today, if you hear his voice, do not harden your hearts” (Heb. 3:15).